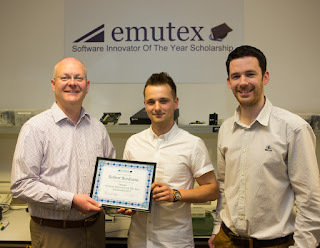 Emutex Ltd., an embedded software solutions company based in Castletroy, has announced the winner of a scholarship programme that was launched throughout Ireland’s Third Level institutions in late 2012. The Emutex Software Innovator of the Year Scholarship was launched to encourage people to take an interest in Engineering from a young age and to highlight what the company described as “a shortage of Computer Engineering and Science graduates throughout Ireland”. Robert Bordianu, who is studying Information Systems and Information Technology at Dublin Institute of Technology (DIT), was named overall winner of the competition which challenged participants to apply their expertise in software and innovation to create an application using a popular miniature computer. Robert, a mature student who holds a full-time job in construction whilst studying part-time at night, will be awarded with his student fees paid for a year as well as a paid internship in Emutex. Prizes were also awarded to Sam Boles (Dublin Institute of Technology) and Eoin Sheils-Ryan (Dundalk Institute of Technology) who finished 2nd and 3rdrespectively in the competition. Robert’s project was to create a pocket-sized file server using a cheap miniature computer. Images, videos and other files were stored on the €50 device. He then developed iPhone and Android apps to access the files from wherever he was. The design notably included a high emphasis on security measures to protect the data on the device. “Essentially this is like a Dropbox™ but gives the owner full responsibility of their information, thus guaranteeing privacy. Nothing is stored in the cloud and so security is in the hands of the user,” Robert explained. John Twomey, Managing Director of Emutex Ltd. said he was very impressed with all the students’ efforts. Mr. Twomey said Emutex will be continuing the Scholarship programme in 2014. He also expressed his desire to see other indigenous companies offer similar initiatives to promote computer software engineering and science. “The scholarship program was launched to encourage students in Ireland to pursue relevant 3rd level courses in order to produce an indigenous work force for the future. Currently, Emutex and many other software engineering companies are forced to go abroad to hire engineers due to the shortage of an appropriately skilled work force in Ireland. Creating computer engineering and science graduates for the future will help ensure that Ireland remains a world leader in the computer software industry,” concluded Mr. Twomey. Founded in 2007, Emutex is a software engineering company that specialises in the design and development of embedded software for communication systems and devices. The company’s software can be found in many types of devices including phone systems, network switches and routers, security firewalls, thin-client displays, alarm systems and metering devices.